The forest is a popular setting when it comes to online slot games. The new slot machine game Gnome Wood is a fairy tale themed slot by casino games provider Microgaming, in collaboration with RabCat Gaming. The video slot game allows you to wander deep into a mythical forest, where a cheeky little gnome is waiting to greet you. Powerful forces, such as the four elements can reward players with huge wins, but the bonus features on offer in this no download needed slot, are what makes this game so exciting. Gnome Wood is a 5 reels and 3 rows slot machine game, which will be available on desktop, tablet, as well as most other mobile devices. As for the number of pay-lines, that stands on 25 winning lines. In addition, the min and max bets players can lay – range from 0.25 to 50, depending on the currency played. Also, the coin size ranges from 0.01 to 2. The slot game has a magical theme which revolves around a haunted forest where all kinds of fairy like beings exist. 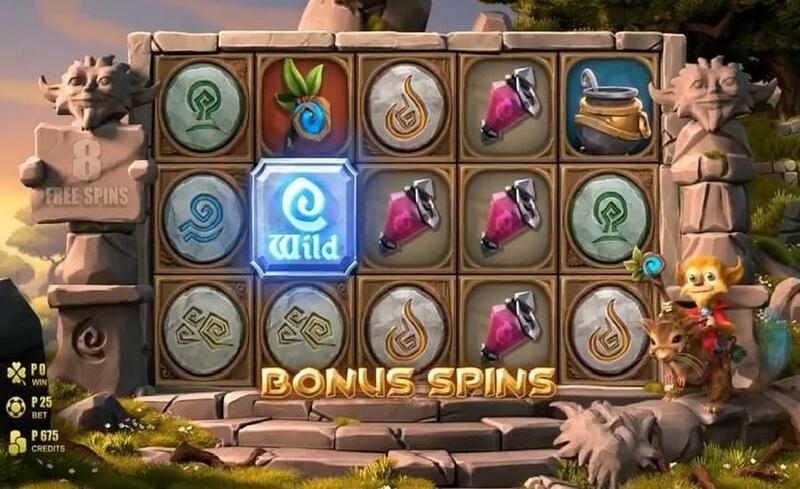 The slots symbols are displayed on a 5x3 grid made from wood and upon those reels are symbols of; earth, wind, fire and water (elements), pink crystal, leafy stick, golden sun, magic book, cauldron, mouse, gnome and wild symbols – oh, and the progressive jackpot symbol of the golden Euro. Adjusting your bets is simple, you use the control panel to the lower of the machine to get to your desired bet, but you can also complete other actions, such as bet max, gamble, view the pay table of payouts and rules on how to play and mute sounds. The design on show in Gnome Wood is impressive – set against a forest backdrop filled with trees, statues and toadstools, the reels include 4 lower value rune-style symbols alongside a lantern, a flower, a book of spells, a cauldron and 2 smiling creatures. Land 5 of the gnome style animal and you’ll pocket an award equal to 10 times your total stake. There’s also a wild that replaces everything apart from the free spins scatter – the wild can also feature a multiplier which can double payouts when it forms part of a winning payline. Whenever the wild lands, you’ll trigger the Wandering Wild feature – all wilds move 1 position to the left on the reels and a re-spin is awarded. These re-spins continue until the last wandering wild has dropped off the left-hand side of the reels. It’s possible to land more wandering wilds during this feature which can add even more re-spins to your total. 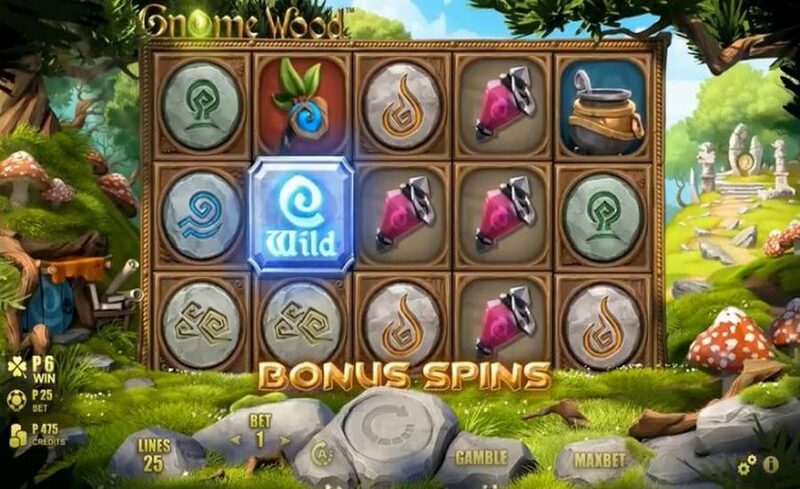 Gnome Wood also comes with a Free Spins feature which is triggered by landing 3 or more scatters on the same spin – you’ll then receive 10 free spins. It’s possible to land Wandering Wild re-spins during this round. You can also trigger more free spins if you land 3 or more scatters. 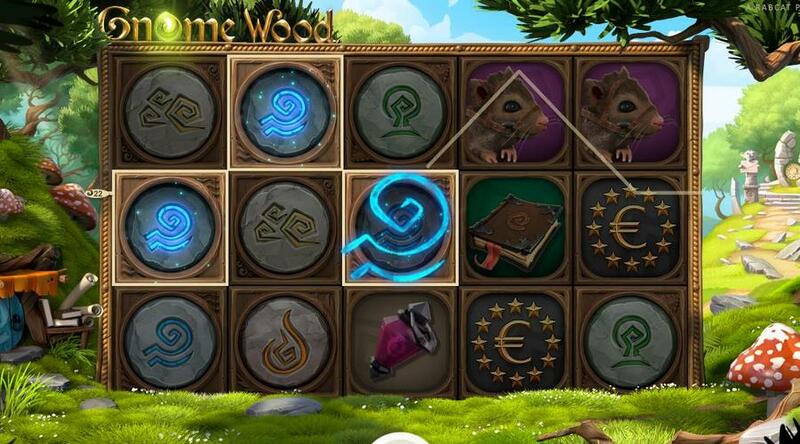 Gnome Wood is a really simple online slot game, with two interesting features. It is a great wagering game, which will help you make a cashout thanks to its plentiful small wins. So give it a try at Mr Green Casino, and let us know what you think.